About the artist: Wassily Kandinsky (1866 – 1944) was a Russian painter and art theorist. He is famous for his thought-provoking and purely abstract works. Born in Moscow, Kandinsky spent his childhood in Odessa and graduated at Grekov Odessa Art school. He enrolled at the University of Moscow, studying law and economics. Successful in his profession, he was offered a professorship (chair of Roman Law), at the University of Dorpat. Kandinsky began painting studies (life-drawing, sketching and anatomy) at the age of 30. In 1896, Kandinsky settled in Munich, studying first at Anton Ažbe’s private school and then the Academy of Fine Arts. He returned to Moscow in 1914, after the outbreak of World War I. 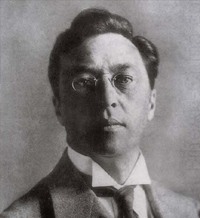 Following the Russian Revolution, Kandinsky became an insider in the cultural administration of Anatoly Lunacharsky, helping to establish the Museum of the Culture of Painting. However, artistic opportunities arose in Germany, and he returned there 1920, where he taught at the Bauhaus school of art and architecture until the Nazis closed it in 1933. Kandinsky spent the remainder of his life in France. In 1939, he became a French citizen and produced some of his most best-known art. He died in Neuilly-sur-Seine in 1944.